Over the last few weeks, we’ve been discussing some simple steps we can take to increase your website’s rankings when it comes to search engines. This is called SEO. Another simple way to get your site to the top of the list is to properly utilize headings. What are Blue Suede Shoes? Notice that the keyword(s) are in the heading, but not randomly put there in a cheap effort to generate more traffic. How Exactly do I apply headings? 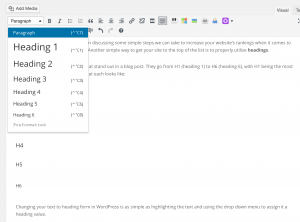 Changing your text to heading form in WordPress is as simple as highlighting the text and using the drop down menu to assign it a heading value. What Heading should I use? H1 is the title of the page or blog post and should only be used once. When you create a post, WordPress automatically places the title at the beginning of your post, so H1 is already done for you. H2 tags should include your keyword(s). Using multiple H2 tags is pefectly fine. For instance, I have used them at the top of each paragraph of this post. You will notice, they are smaller in size than the title of the post at the top. The rest of the tags (h3, h4, h5, h6) should highlight text in order of importance. Most posts and/or pages don’t use anything beyond an h3 tag unless there is a lot of content. Finally, do not skip numbers. It is important to use h1 tags, then h2. You don’t want to skip over any headings. Headings on the internet are like headings in a newspaper. They allow the reader (and search engines) to know what the post or the page is about when it is quickly scanned. Headings also help readers stay on a page longer. This is called a bounce rate. You want to keep readers on your page, and actually reading the content. One way to do this is to employ the use of headings so that your readers can easily scan the post. Most people don’t read in depth anymore (let’s be honest, we have a shorter attention span than a goldfish). Employing headings not only increases your chances of ranking higher on Google, it keeps readers engaged. 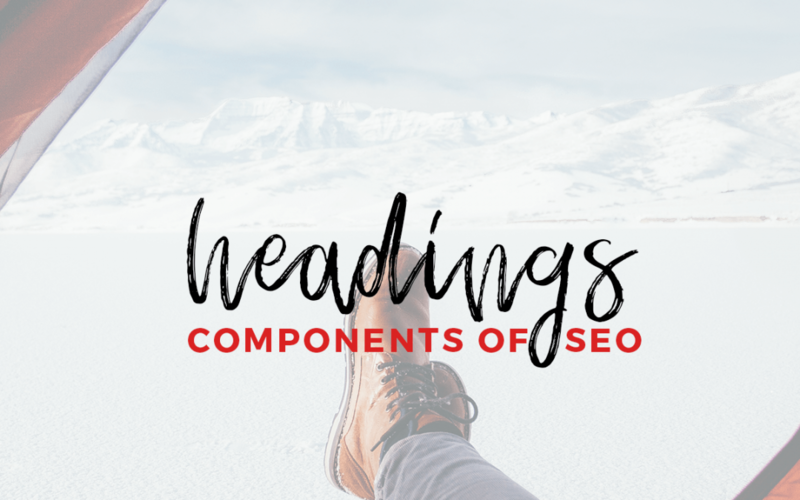 In conclusion, headings are a great way to not only increase traffic to your site, but make your pages and posts more readable. At the end of the day, who doesn’t love a post that is quick to read and easy to understand? !